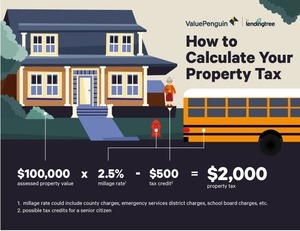 ValuePenguin released a study to determine where property taxes have increased the most, and it is not great news for Connecticut. All four Connecticut Metro areas placed with the top 6 in the rankings for the top increase in effective tax rate for the last 10 years. All four Connecticut metro areas saw a decrease in the median home value over the last 10 years. Nine of the top ten listed above also saw a decrease in median home values, although only 20.85% of the metro areas listed saw a decrease in median home values. The Bridgeport-Stamford-Norwalk, CT metro area had the third largest decrease in median home values, beat only by Salinas CA ($-141,500) and Madera, CA (-$91,400). "ValuePenguin calculated the effective tax rate in each metropolitan area by comparing a region's median real estate taxes paid and home value. We only used data for owner-occupied houses, and contrasted figures from 2007 and 2017, the most recent year for which data is currently available. Metropolitan areas were excluded from our analysis if data was missing for one or both years surveyed."